This morning we’re going to take a short break from analyzing the 76ers horrible level of play over the last ten games and the results it has produced. We’ll get back to that later this afternoon. 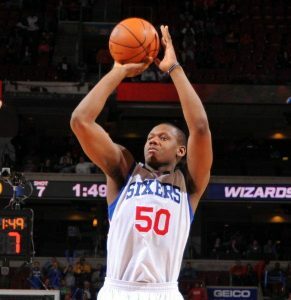 For now, please enjoy this video feature produced by Philadunkia’s Tim Parker on Sixers rookie Lavoy Allen. At one point this season Allen was a valuable starter / contributor off the bench for the Sixers — see the 15 points he had vs. Chicago back on February 1st. However, over the last eight games Coach Collins has reduced Allen to a mere spectator — Allen is clocking only 5 mpg. over his last eight runs. “Why has Collins stapled Allen to the pine?” you ask. So until we find an answer to that question, enjoy this feature and reminisce about when Lavoy was allowed to contribute to this team.